Basic soap recipe sounds so boring, but this is my “go to” recipe. I really like this recipe because it is simple, and it has always worked out great. It makes a wonderfully hard bar that lasts a very long time, and I can add whatever kinds of lovely extras to it like essential oils, flowers, or exfoliators like ground oats or coffee grains. Keep in mind that you can substitute Vegetable Shortening for the Tallow if you like, just make sure it is of high quality. A lot of vegetable shortening has extra ingredients to stabilize and preserve it. Those go into the soap and then your skin will absorb them. For more information on soap making see Soap Making 101 and the “Homemade Soap” tab in the Navigation menu at the top of the page. If you are searching for Lye, you can find some HERE. It’s good lye, though I laugh at the idea of “food grade” lye. It may cure olives at a seriously diluted consistency, but don’t go putting it near your skin! If you’re looking for some local, try a hardware store and look in the plumbing section. I’ve had a few mishaps with lye having rocks where I had to sift it, or even had my lye water turn neon blue from some crazy chemical they added. So don’t buy them out on your first visit. Find a brand that works. Combine tallow, olive oil, and coconut oil in a stainless steel pot and heat to 100 degrees F.
Outside, pour lye crystals into water and let cool to 100 degrees F.
Pour lye water into oils when both are the correct temperatures and mix with a hand or stick mixer until trace. Is it cold lard or shortening you use or liquid? I started with room temperature lard. I just asked our local natural foods market if they would give me fat scraps that I can work down to tallow so I hope to be doing that in the future. It’s hard to find even plain lard at the grocery store that doesn’t have added extra ingredients. Never thought about that. Shouldn’t be so difficult to find unmessed about food. But it can be. I’ve made homemade (beef) bone broth and after you chill it for 24 hours, it has a nice, think, pure white layer of fat. Stupid question, but is that tallow . . . or lard? Can I use it like that or does it require further processing. I stuck it in the freezer just it case it was something I could use later. I’m getting up the urge to try making soap to give away as Christmas gifts. Thanks, Kelly — love your DIY recipes, helpful videos and love your shampoo bars! Tallow is beef fat, lard is pig fat. I’m going to make my own as soon as I can get around to it. For now, I found a strong box at Big Lots that I lined with wax paper. It works great, but makes 5 oz bars and I’d like to make 4oz. It makes 5.44 pounds or 87 ounces. 21-22 4ounce bars. Can I use pork lard instead of tallow? This recipe looks exactly like what I am looking for. Straightforward and simple. 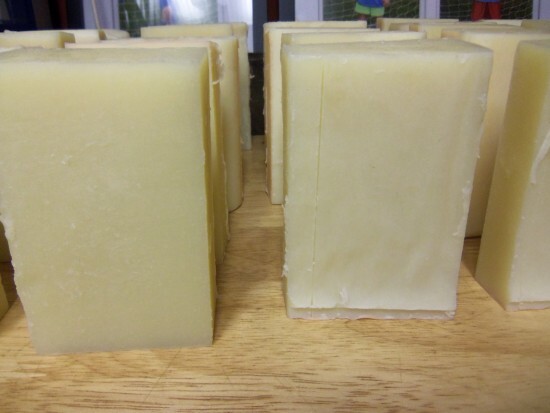 I have been wanting to try to make soap but was always nervous working with the lye. This recipe looks simple and I am going to give it a try. Thanks for sharing it with us. Just the recipe I have been looking for! Simple and pure. Thanks! Where do you get your lye? Are you able to find it locally or are you buying it online? I get it from a local hardware store in the plumbing section. The bigger chain hardware stores around me do not carry it. So, try your smaller stores with a plumbing section. Make sure it’s pure lye without and added drain chemicals. This recipe is very similar to the one I use–got it from the West Ladies video. I think the easier soaps are best! My favorite soap uses this recipe but I add ground up oatmeal and oatmeal mik and honey fragrance. Thanks for sharing on Wildcrafting Wednesday. This is great – I am passing it on to my daughter, who is very interested in learning to make soap. Thank you so much! I’ve been wanting to try soap, and this looks like an easy beginning recipe. I’ve wanted to make homemade soap for a long time but I’ve never gotten around to it. This recipe looks really straightforward though. I’m inspired again. Thanks for sharing! I’ve not attempted to make my own hand soap (I do laundry and dish soap though). This sounds simple enough I might have to try it. Thanks for sharing it at Savoring Saturdays. I have never made soap before. Thanks so much for sharing this with the Let’s Get Real party this week. I am pinning it to our group board. Your Basic Soap Recipe will be featured at Savoring Saturdays tomorrow morning. Congrats! Thank you for sharing! How great, I had no idea that lard was in soap. Thanks for linking up to Sweet and Savoury Sunday, stop by and link up again this weekend! I’ve been making soap for a while now, but this is the first time I’ve used lard. I was teaching my niece and lard was easier to find then palm oil in her town. I used a bar on my hair and body this morning and I am very happy. It is hard to convince people that a bar soap is great for your hair. My hair dresser always remarks on how great my hair is. Not only that I travel quite a bit and guess what, no shampoo and conditioner in my suitcase. I added Rosemary and Mint EO for a fresh scent. I also made half the recipe because I want my niece to make a second batch for practice and learn how to use a lye calculator. I used a bar from the first batch on my hair and body today and it was fabulous. As a matter of fact I like it better then the 100% vegetable oil soap I make. It is hard to convince folks to use a bar soap on their hair. My hair dresser has asked if I would sell in her shop. She loves the condition of my hair. I travel quite a bit and guess what, no shampoo or conditioner in my suitcase. I have a passion for science, chemistry, food and wholesome homemade products. Soap making checks off allot of boxes for me. That is so true. I also love science and it just falls right into that category. 🙂 By the way, I love Mint and Rosemary EO together too. It is such a refreshing soap. I use these oils as well, just on a smaller scale. Very easy to formulate on a lye calc. I can add or subtract different oils and make how much I want to. I have been double checking on different lye calcs because they all seem a tad different. I love making soap, so Ive been making it a lot, so I need to make smaller batches, that way I can experiment, find perfection and go from there. Hi, I can’t wait to try this recipe! I looked all over the internet trying to find a recipe with just lard, olive and coconut oil and this sounds perfect. I am new to soap making and was wanting to make a rosemary, peppermint, spearmint combo. How much essential oil of each would you suggest with this recipe and would all 3 be ok together? Also do you ever add the 3 of these dried to your soap plus the essential oil? If so will the rosemary soften or should I grind it first? Thank you so much!!!!!!! The combo will work great. That’s very similar to my “Wake me Up” Soap. Any herb you add to soap needs to be dried first. They can turn into brown spots over time so it’s best not to use too much. Definitely add essential oils and herbs. Great combo. 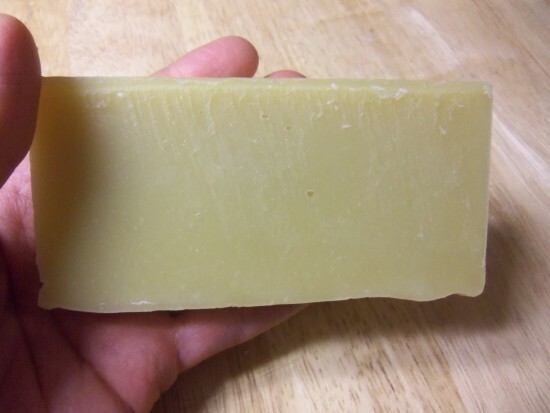 I want to try making soap, specifically your shampoo soap recipes. I was wondering if I could use a silicone mold? Amazon has some that are either loaf molds, or individual molds. Could I use the individual mold so I don’t have to cut the soap? Does it make a difference? Yes, you can use a silicone mold. They will work fine. Just make sure the recipe will fit in the size mold you have. I’ve been wanting to make soap but have a simple question. I have been saving the chicken fat from my broth making. Do you think that chicken fat would work to make soap? I was looking at your shampoo recipes (5 & 6) but settled I won’t get enough ingredients here in South Africa. My hair is oily, but healthy, and I only wash it once a week. So basically, I just want de-greasing properties, decent foam, a hard bar and mabe some volume. I do have the ingredients for this basic soap, and want to alter it it so it’s slightly better for hair, I’ll stick to the lye calculator. I’ve found some Betonite clay. I can get all sorts of essential oils – do you recommend any that are specially good for hair? So if I press on in hunting, and can only find one or two more “Hair” ingredients, what would you recommend I still buy? Hello! I was wondering if you would share your recipe for cinnamon honey soap? I bought some and LOVED it. I began using it for my face as well. I’m in Level Green, and if I could stop by your house to buy some (before I get the chance to make it), that’d be great. That would save me the cost of shipping. Please let me know. I don’t have any right now, but I have a pumpkin spice that smells very similar. I’m going to take some over to Carie’s shop this afternoon. I will be making more cinnamon and honey this week. The recipe is on my site. I can’t get the url this second, but you could do a quick search top right or go to my soap page. Thanks, Kelly. I’ll ask Cari to give me a call when she’s got more of your cinnamon and honey soap in. The pumpkin smelled nice, but I love the cinnamon/honey combo. Thanks. Yes, you can use lard instead of tallow. Important question: 18 bars (will be a little over 4 oz each). A 5 lb recipe. Okay I’m confused… You’re saying the recipe produces 5 lbs of soap. I’m adding up the oils and coming with 52 oz (3.25 lbs). Am I supposed to add in the water too? I have to 2 lb molds (2 each) that I want to fill and I am trying to adjust the recipe to produce 4 lbs to fill those molds (*and* make an adjustment in the calculator to use mutton/sheep tallow rather than beef). All these calculations are making my head spin – am I having a redhead/old phart moment? Yes, you need to include the water. This will make 5lbs. Thanks for the clarification! Previously I have never included water in the calculation for final product. I get confused about the essential oils. It seems that my soap comes out either to strong or to mild. Iv been trying to get the inexpensive essential oils that I find on Amazon.com and wondered is it beneficial to get the more expensive kind and use less? Some essential oils are naturally stronger smelling than others, and some (like citrus) fade quickly. I use 1 oz for 12 bars or 48oz of soap and it is a light scent. Most oils I’ve found on Amazon (not all, it depends on the brand) are cheap because they are either seriously diluted with a carrier oil (they lie about it, but it’s obvious if you use essential oils a lot) which means you have to use more anyway. Or they have fragrance oils mixed in, which are very unhealthy for you! Your best bet is to always use e.o. you trust and just get the hang of how much to use. food grade lye is a “real” thing.. not some unicorn recipe. 🙂 if you have ever eaten an olive or bought canned tomato/sauce it is almost always processed with lye. “food grade” means its in a clean environment and they went through the trouble of not allowing scrap teeny parts of metal to contaminate it. thanks for the recipe. Oh, definitely! Quality is important so that, like you said, no extra bits of rocks or anything else is in your lye. I need to reword that. What I meant by finding it funny is the thought of eating something so caustic. Is it fluid ounces or weight ounces? Fluid ounces in weight. Set your scale to fluid ounces with a bowl on top, set it to zero, and start pouring and weighing. Can I use palm oil or another butter or oil instead of tallow or lard? You can use palm oil or babassu oil instead of tallow. Make sure you run it through a lye calculator first to see if lye amounts or other qualities make it need to be altered. I will definitely be trying this, looks easy!! I’ve been making my own soap for a couple of years now, trying a variety of recipes. I’ve been impressed with the hardness of tallow. I have been using beef tallow that I rendered from cast-off fat from my local grocery store butcher. Yeah I know not the best but hey it’s free. Anyhoo I just came back from visiting friends who raise their own sheep and they saved the leaf fat from their recent harvest of lambs. I just started rendering the first batch of tallow and I am amazed how hard the lamb tallow is. Short story is that I am uber excited to be using the lamb tallow to craft into soap. I will be using this recipe for sure (after running it thru a lye calculator for any adjustments in the beef/mutton difference). Thanks much for sharing your recipes! This is something I’m definitely going to try this year! My husband is a hunter and a bear has way more fat than I can use in the kitchen. I think soap making will be the perfect use for it! Have fun! Let me know if you have questions.